An interview from China Daily on Yao Ming who talked on why he is working so hard to bring sports/physical education back to school. Basketball icon Yao Ming said he thinks his presence in a popular reality TV show could draw more attention to children's all-round development through sports activities. 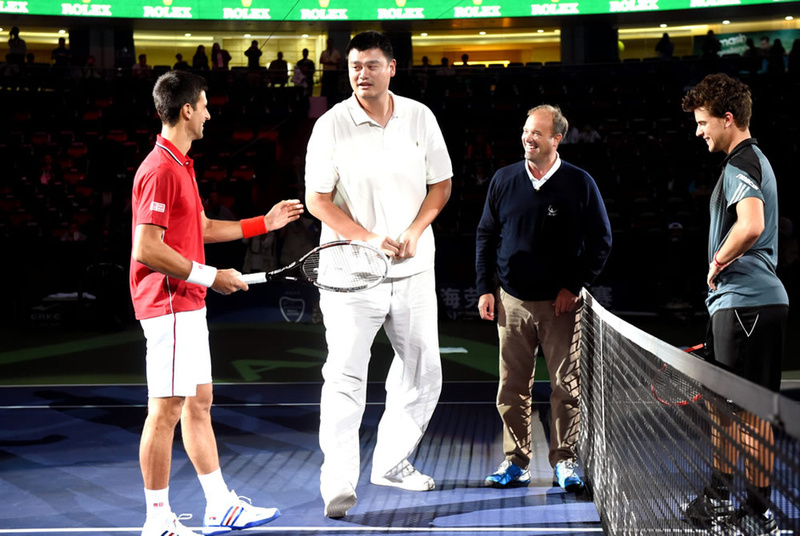 Entering the entertainment business has become trendy for retired athletes to stay in the public eye, but that's not the case for Yao, despite his participation in the hit reality TV show Where Are We Going, Dad?. 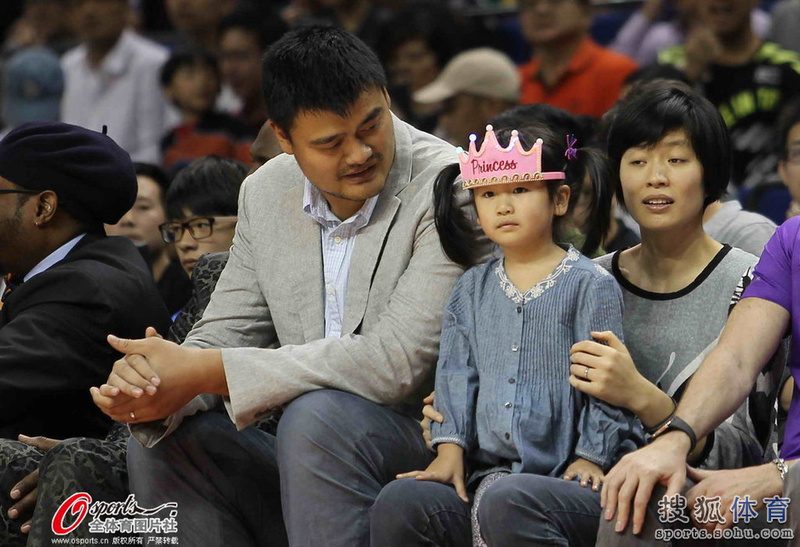 The show, which features trips of fathers and children set audience records in the first season and became a nationwide sensation following word that Yao would participate in the upcoming second season. In typical low-key style, the former NBA All-Star plays down his role in the show and said he sees it simply as publicity highlighting the importance of physical education in child rearing - a concept that he actively promotes through various charitable initiatives and physical education events since his retirement in 2011. "I hope to send out a message that sports can teach children many virtues that they couldn't learn in classrooms, and to influence more people to pay attention to children's all-round development," Yao said after a charitable event at Shanghai's Ziluolan Primary School on Thursday. The event was part of the Yao Foundation Hope Primary School Basketball Season, an annual charitable program that organizes students in underprivileged areas to participate in a two-month basketball training camp where they learn the virtues of teamwork, leadership and socializing. 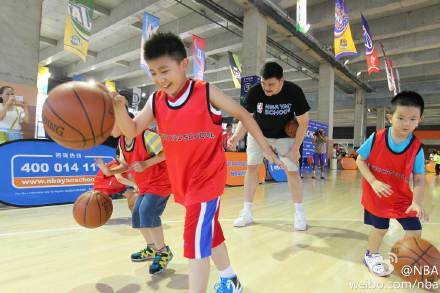 This year's event, which kicked off in late April, has expanded to 80 primary schools across China and has so far encouraged more than 151,500 students to complete the two-month stretch, during which college volunteers teach basketball skills. 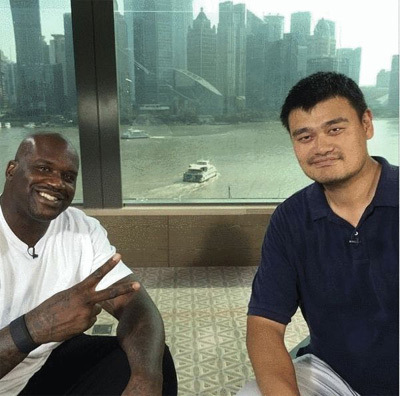 "Our aim is to teach children to take part in sports, not to train basketball talent for professional teams," said Yao, who has been bouncing between his roles as a businessman, basketball club owner and charity promoter since 2011. 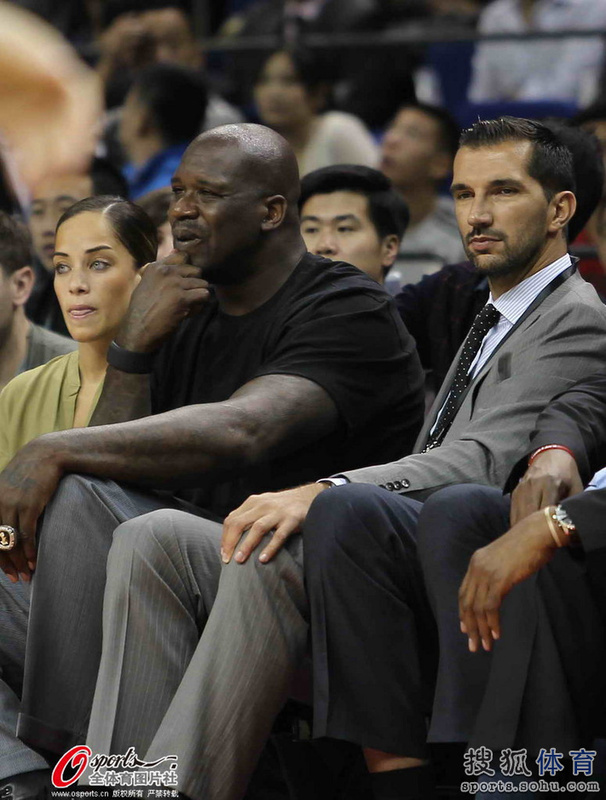 Shrugging off the foot injury that led to his retirement, Yao ran up and down the court with students in a mini-exhibition game against another team led by NBA star forward Nicolas Batum of the Portland Trail Blazers. 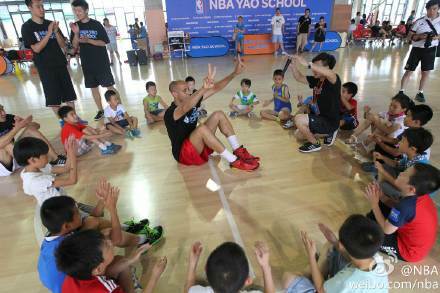 Batum joined forces with Yao as an ambassador of NBA Cares, the National Basketball Association's global community outreach initiative that addresses social issues such as education, family development and health. 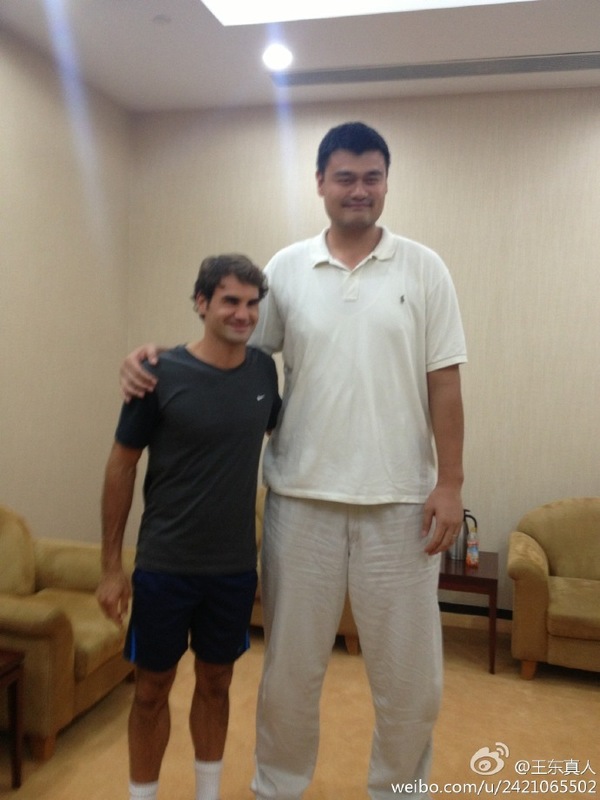 He echoed Yao's sentiment that sports really matter in children's development. "It's big. When you are young, playing games like basketball and soccer can give you opportunities to do a lot of things to open your life," said the 25-year-old Frenchman, who entered the NBA in 2008. 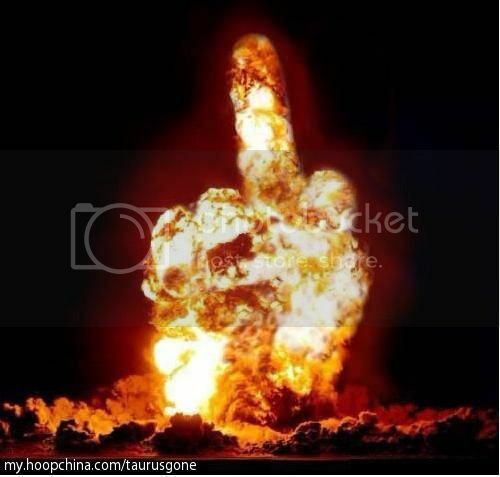 Hi everyone, now that the NBA season is over, I wanted to let you know I will need to take the forum down sometime in the next few days to move it to a new hosting provider. I have been wanting to do this for years, but it's such a big job, I think I have found someone who can help me do it. So if you come back to the forum and you see it's not available, you'll know why. Just keep coming back and hopefully it will be ready for you by the end of this month (June). 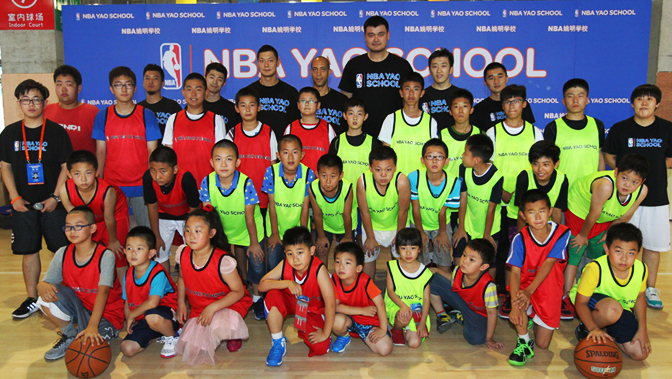 On June 21 (Saturday), NBA Yao School had an open media day for its 2nd class. 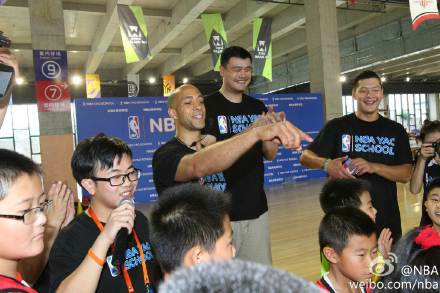 NBA Yao School's principal Yao Ming was there with 50+ of the class practicing basketball fundamentals and shooting. 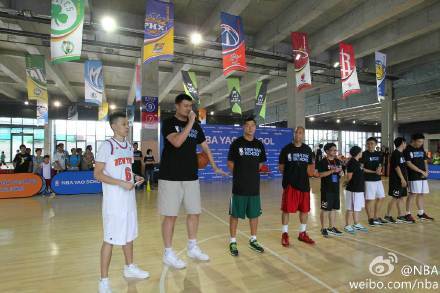 Yao Ming acted as the assistant coach there to teach some of the basic fundamentals on defense to the kids/lads. Eric Shang Ping, who had finished his 1-year-contract with Greek League club Panathinaikos, was also invited to the camp to teach the students some basketball fundamental skills. And there was this free throw shoot out between 4 teams of kids/lads led by Yao Ming, Shang Ping and 2 other coaching staff of the camp. 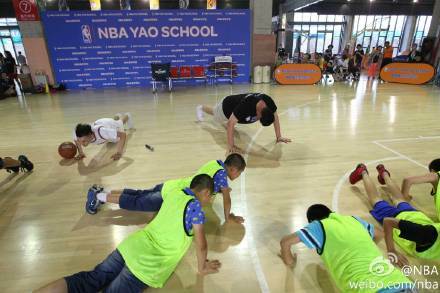 The team led by Yao Ming lost, and the whole team, including Big Yao, had to do 5 push-ups as their punishment to come last and lost the free throw competition. I just realized I had been SO LAZY that I've not updated this thread for over 3 months now !!! 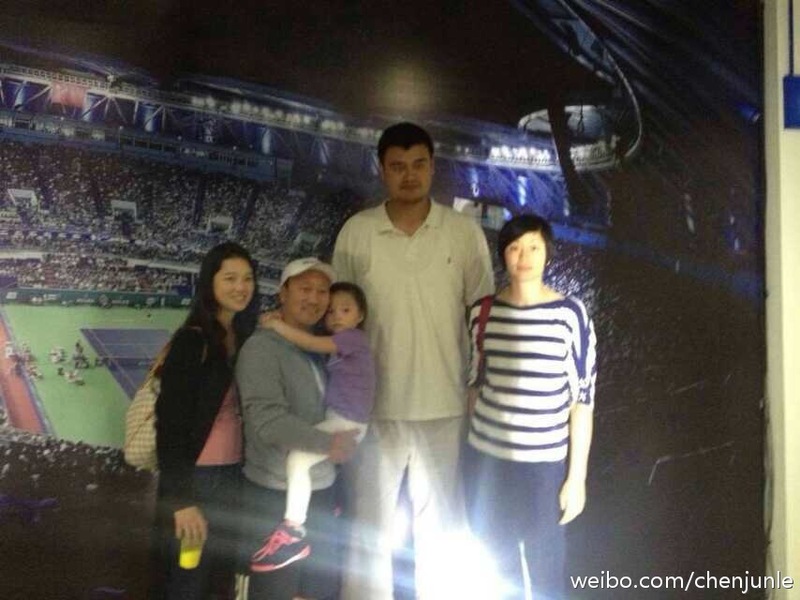 Anyway, Yao Ming and Family were at the courtside yesterday at the 2014 Shanghai Rolex ATP Masters. 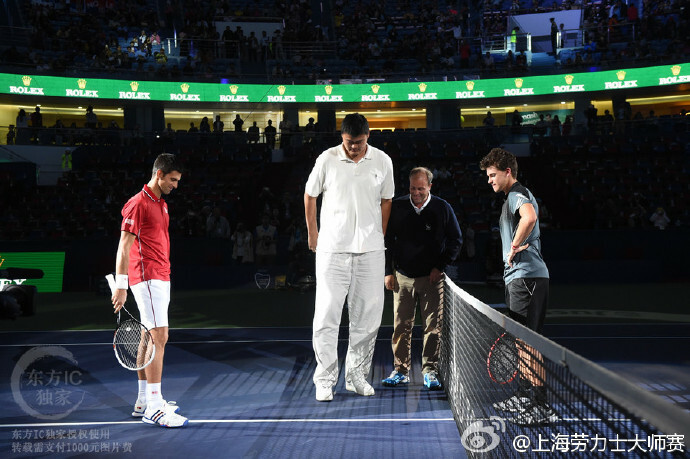 Yao Ming was the honorable guest to pick side for the match between #1 seed Novak Djokovic vs Austria's rising star 21-yea-old Dominic Thiem in the centre court. 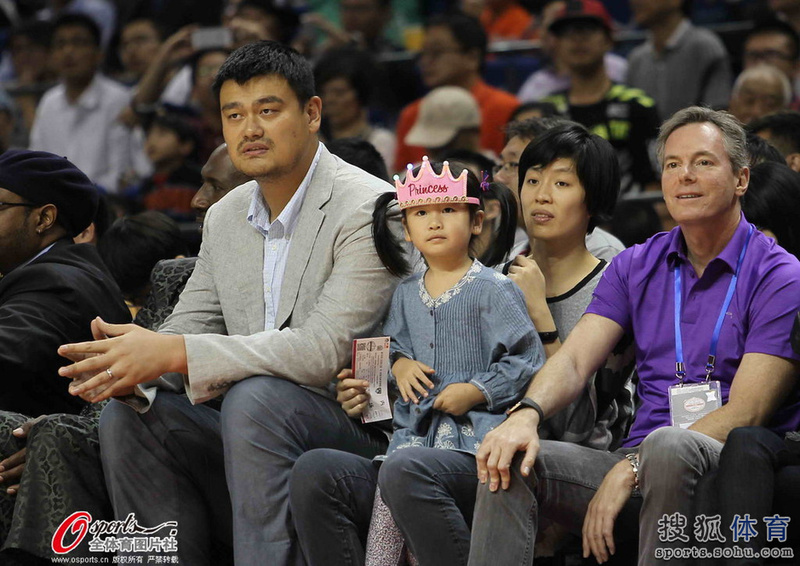 Yao and family then watched the game in the spectators' stand. 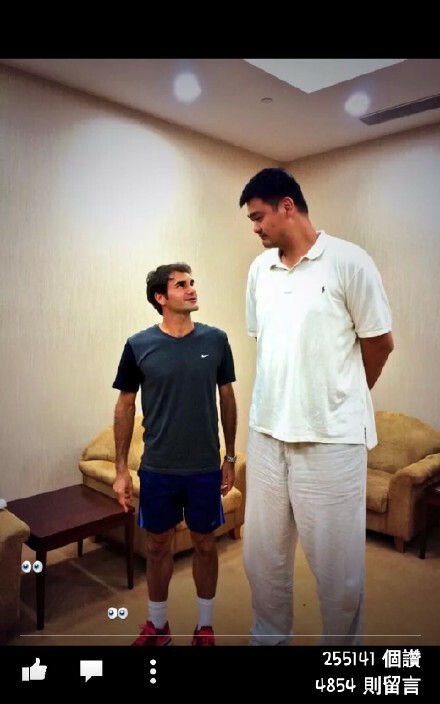 And right after the game, Yao Ming had photos with all these tennis greats: Roger Federer, Novak Djokovic and Michael Chang (and family), and made them all looked like MIDGETS !!! 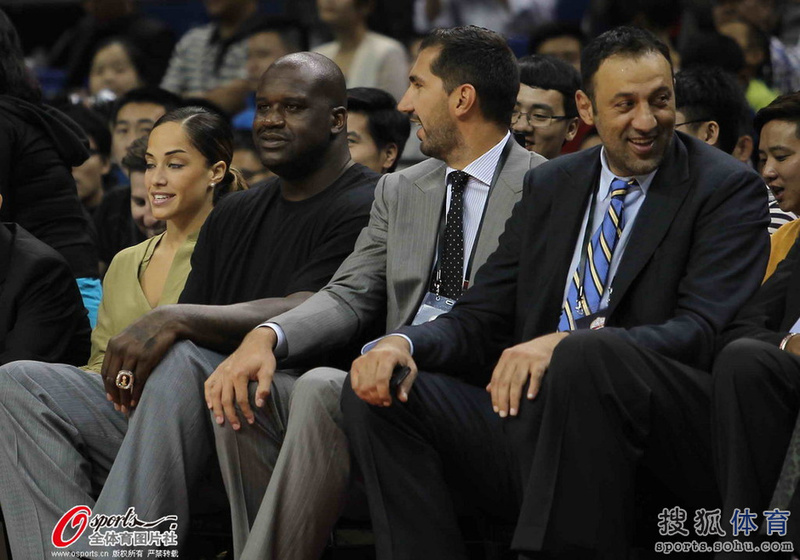 Yao Ming and his family (wife Ye Li and daughter Amy Yao Qinlei) were there at the courtside of the 2014 China Game between Brooklyn Nets and Sacramento Kings in Shanghai, and so were some other retired legends like Darryl Dawkins, Shaquille O'Neal, Vlade Divac and Peja Stojakovic !!! 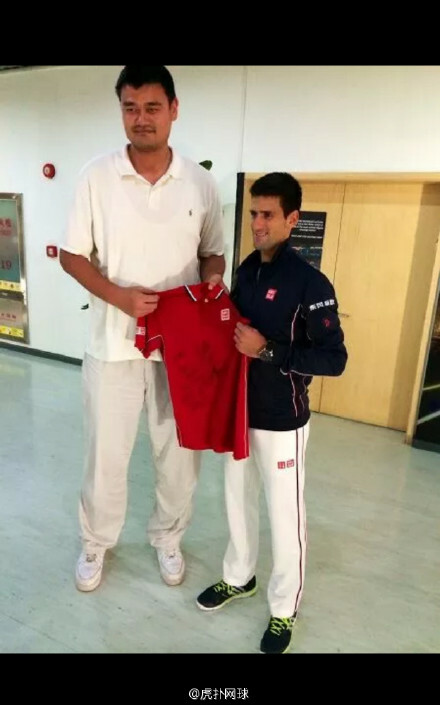 Yao is DEFINITELY HUGE. 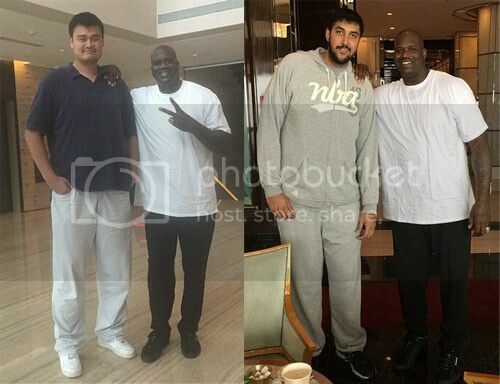 He made Shaquille O'Neal looks miniature !!! 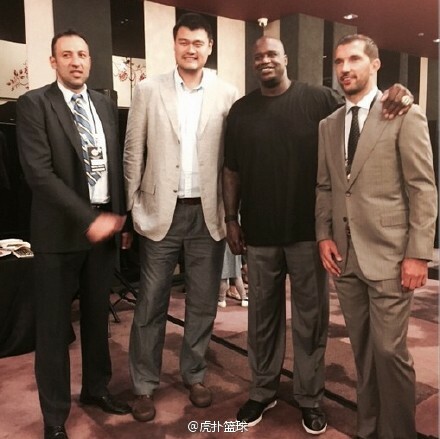 Photos of Yao with Shaq in the hotel that Shaq stayed. what r u talking about.